Column Formwork stands for a mould or open box same as container into which fresh concrete is poured and consolidated. As soon as the concrete is arranged, the formwork is detached and a solid mass comes out in the form of the inner face of the formwork. The top of the formwork is kept uncover. • Adequately strong to withstand the pressure or the weight of the brand new concrete as well as any constructional live loads. • Hard enough to maintain the shape devoid of unwarranted deformation. • Inexpensive concerning the total cost of the forms and the concrete surface finishing if necessary. • Perfectly water resistant to get rid of leakage at the joints. • Column formwork is generally constructed with either timber or metal panels. 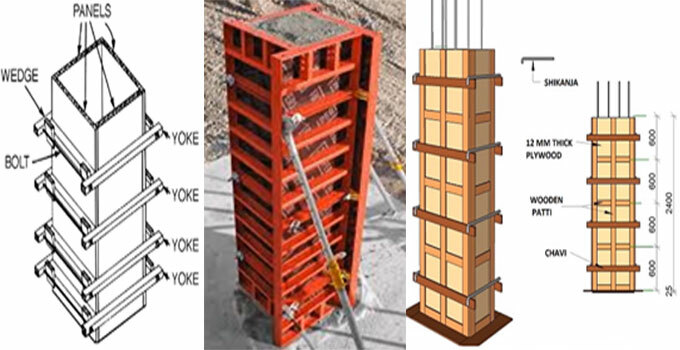 • The principle is to generate an enclosed box having frames at the proper size of the column and set it firmly on the kicker left from base or at the last stage of column concreting. • The box is retained in position through steel column clamps or bolted yokes and supported with timber studs or props. The column formwork systems generally come in modular in nature and facilitate rapid assembly and erection on site whereas reducing labor and crane time. The forms which are built up with steel or aluminium, often contain a timber form-face lineer. It is adjusted on site to provide various column sizes. There are different types of internal surfaces on the basis of the concrete finish needed. For metal formwork systems, there should have been elemental concreting platforms having guard rails and access equipment along with ladders. This minimizes the requirement for independent access. In some systems, the props employed to settle the column formwork are elemental. The metal forms can be easily cleansed and reprocessed with little waste with reference to customary formwork. For onsite demonstration, watch the following video.